If, say, 100 feels like too much to you, you should not enter negotiations with the goal of “spending less” or “less possible”. First of all “less possible” implies the concept of “the lowest possible price for the same quality”, which might even be more than you had in mind. In order for negotiations to be effective you should start them with a clear knowledge of the amount you want to spend. I know, you might think “but how can I know how much a wedding bouquet could really cost? !” but for a successful negotiation you don’t need to have that kind of technical information, all you need is the awareness of the budget you can allocate, and that is an information you should have at this point. If you haven’t got it, please take some time to carefully estimate it. Defining an affordable wedding budget should be the first step of any wedding planning. Once you know how much you can spend, don’t be afraid to be transparent about it with your vendors, if you expect them to be transparent with you. Approach them by saying “look, I really like what you do, but I cannot afford to spend 100. Now that you know what I like, what kind of service/product could you provide for 75 [enter the budget you have here]?”. If the wedding professional, for any legitimate reason, is not willing to work for that amount (maybe they have a complex company structure with high costs), they will withdraw from the negotiations without wasting any more of your time. If they’re true professionals they will probably refer you to a colleague in your budget range, while if they should reply in outrage you will know you’ll be much better off without them! More often though, the wedding professional will be willing to try and make the relationship work, providing a slightly more limited service/product which will fit your budget. Thus both of you will be able to begin a working relationship where you don’t feel ripped off or exploited. I know, this should be quite obvious, but it’s always worth repeating. The price cannot be the only factory you examine when you compare offers. Accordingly, you should better not approach a negotiation with the remark “oh, but your colleague X does the same for less”. First of all, if vendor A asked 70 and vendor B asked 100, but you’re trying to close the deal with vendor 100, that’s very possibly because you saw that vendor B is actually offering something BETTER (please allow me to go caps with this one). ‘Better’ could mean of higher quality, or with a more attentive service, or with a greater attention to detail, or prestigious/exclusive, or coming from a greater experience, and all of those things simply have a higher value than their lesser counterparts. Maybe their value isn’t compatible with your budget, but it certainly justifies the higher price tag. Your best shot at this is going back to the first piece of advice and approaching the vendor trying to find a way to squeeze their added value into your budget. This will certainly require some compromising on the item list and the extension of the service/product though. The price of a wedding favor is determined by production costs, distributing fees and the seller’s margin. These are usually pretty objective and standard costs and on average Gross Sales Margins in commerce are around 30% (this is a very volatile info, but just to give you a general idea). In this context, asking for a 5% discount on your wedding favors is an entirely legitimate and pretty safe negotiating strategy. Clearly it’s still up to the seller to decide whether the sale will be profitable and sustainable with a reduced margin, but even if they should agree only unwillingly, the reduced price would get you same exact product you would have had at a full price. This kind of negotiation doesn’t work as well with services. First of all, if the wedding professional you’re dealing with is a freelance or a consultant whose main work is creative/intellectual (like the graphic designer designing your stationery, for example) what they’re selling to you is their skills, experience, time and the experience of working with them, all things whose cost can hardly be objectively calculated. This is one of the reasons why gross margins for services are usually considerably smaller than for products and sometimes nonexistent, squeezed between service value and market expectations. The wedding professional will estimate the scope of the work and amount of time needed to accomplish it, and make you their offer, but this estimate can very often end up being inaccurate for a number of reasons thus eroding any margin. A wedding professional knows that from painful experience so they will never be fully comfortable with lowering their estimated fee for a given service. Especially if that estimated fee applies to a custom service that has been personalized to fit your requirements. 1. the wedding professional will feel unappreciated and will enter the assignment without any excitement, knowing that they haven’t been chosen for their skills and that you’re likely not aware of the difference their talent will make to your project. Mind you, this might not be true, but focusing the negotiation on price that’s the feedback you have implied, that price is more important to you than talent and skills. If the wedding professional is a true professional they will still give their best given the circumstances, but it will not be the same best you would have had if the professional had been certain of your trust and appreciation. This is not blackmailing, it’s an understandable outcome if you put yourselves in their shoes. If your boss told you “anybody could write this pitch and you’re the only one available at the moment so I’m assigning it to you” how motivated would you feel to complete the assignment at your best?! 2. the wedding professional will make you pay for any add-on which was not originally included in the contract. And there will be no discounts this time, if you want the job done. Again, this is not retaliation and again you can clearly understand that if you think of it in an office scenario. Let’s say you’ve worked like a dog going far beyond what’s required by your position in the hope of gaining a promotion, but when the time comes your boss denies you said promotion. What would you do the first time you’re asked to stay after hours? Either you’d refuse or you’d require extra pay for it, wouldn’t you? Again, the best negotiating approach is going back to my first advice above and let the wedding professional decide whether they’re willing to work at your budget and what they’re comfortable including. Ideally you would like to go from 100 to 75, but let’s say you actually adore this florist and flower decor is the most important thing for you (in this hypothetical scenario). If you’re honest with yourselves maybe you could take 5 off of your transportation expenses and spend 80 on the flowers. This kind of strategical thinking is rooted in your awareness of your priorities about your wedding, so my advice is to make sure that by this time you are clear about them as you are about your budget. Knowing your priorities as well as your budget will allow to negotiate with vendors with an open and flexible approach, explaining to them that you can spend 75 but knowing deep down that you could go up to 80, and leaving yourselves room for choice. 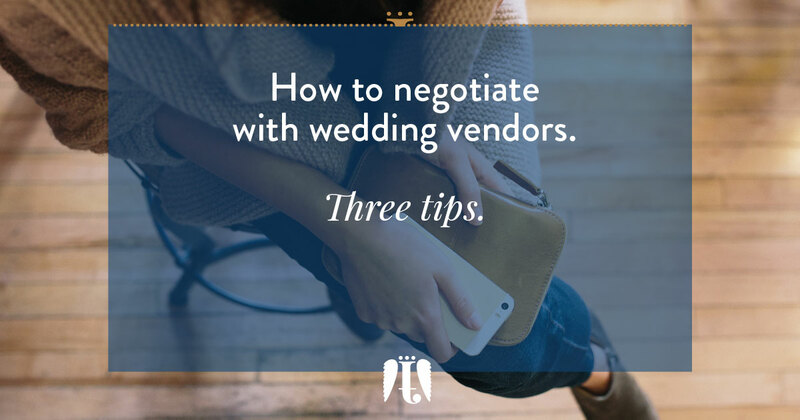 Finally, remember that negotiating price is just the first step in a relationship that will allow your vendor to execute your vision for the day. Clearly you shouldn’t spend above your limits, but don’t think that once you’ve got the lowest possible price you’ve done the most. Negotiating is laying the foundations of your relationship with your vendors and you want that to be the best relationship possible. I hope these instructions will land you the best deals possible for your wedding! If you have any particular situation you want advice with, please write about it in the comments below, I would love to help you out and to make this the place for a meaningful debate with vendors as well.